First step is figuring out which location you want to use for deploying your resources. 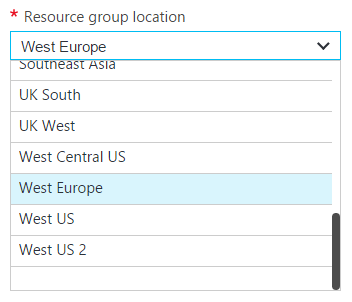 If you’ve been using the Azure Portal, the location dropdown menu should be familiar. The location is needed to create any resource in Azure. In PowerShell you can get a list of available Azure locations, using the Get-AzureRmLocation CmdLet. This will output a list of Azure locations including the location name and display name. Once you find the location you want to use, make not of the name of display name; the CmdLets in the following commands accept both the location name (eg. eastasia) as well as the display name (eg. East Asia). Getting the available VM sizes can be done using the Get-AzureRmVMSize CmdLet. The only parameter it needs, is the location. This can either be passed by piping the output of Get-AzureRmLocation CmdLet, or by manually defining the parameter. The following 2 commands will give the same result. The CmdLets output a table of available VM sizes, including information on number of cores, memory, etc. Next step is to get the available images for your location. 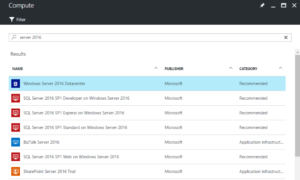 In the Azure Portal, the VM images can selected when creating a new Virtual Machine. The image selection allows you to search for the images, but it will not tell you if it’s available in your preferred region. All these CmdLets use the “location” parameter as mandatory input. The location parameter can be used as described in the previous chapeter. To start off, we need to figure out the publisher of the image we want to use, so we’ll be using the Get-AzureRmVMImagePublisher CmdLet. PS C:\Windows\system32> Get-AzureRmVMImagePublisher -Location "West Europe"
Now make note of the publisher you want to get the offers for. 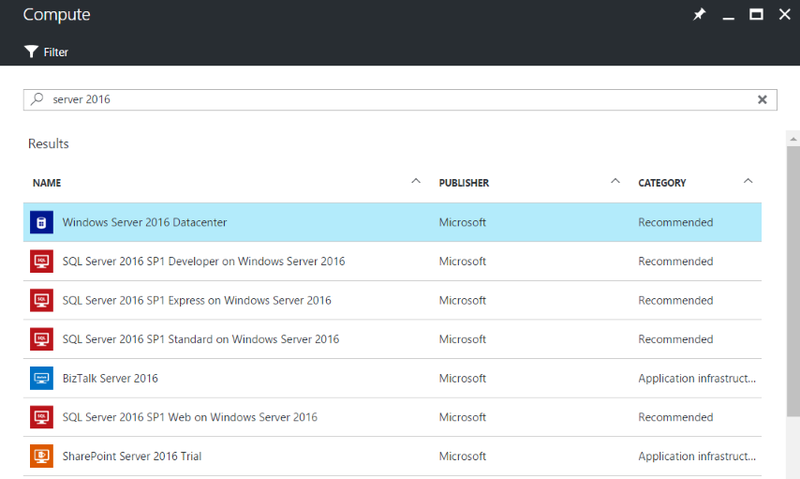 If you want a Windows 2016 image deployed, you’ll need to use the “MicrosoftWindowsServer” publisher. Now, to check the offers from this publisher, we use the Get-AzureRmVMImageOffer CmdLet. Get-AzureRmVMImage -Location "West Europe" -PublisherName MicrosoftWindowsServer -Offer WindowsServer -Skus "2016-Nano-Server"
PS C:\Windows\system32> Get-AzureRmVMImage -Location "West Europe" -PublisherName MicrosoftWindowsServer -Offer WindowsServer -Skus "2016-Nano-Server"
If nothing is returned, there’s no image available in your selected location for that specific SKU. This brings you at the end of the process of the image availability check. Next step could be deploying a VM using the selected image. This command would be running for a while; it will retrieve a lot of data, so I advice you to output the data to a file using Set-Content, Out-File or Export-Csv. I’ve written 2 scripts which can export the available VM sizes and images to CSV, as I described in my new post. The scripts have been uploaded to the Microsoft Technet Gallery. If you like the scripts, don’t forget to give the scripts a rating on the Microsoft Gallery page. I hope this article was useful for you. If you have any questions, don’t hesitate to leave a comment or drop me an e-mail. Thanks!, I made the script below to quickly look for images when creating templates/scripts..
Get-AzureRmVMImage -Location $loc.Location -PublisherName $publisher.PublisherName -Offer $offer.Offer -Skus $sku.Skus #pick one! Really helpful thanks – especially since the VM selection blade in Azure only lets you specify minimums, I’m usually on a budget so need to specify maximums of mem/cpu !